In Florida, personal injury lawsuits are filed at the county courthouse every day of the week. These cases proceed through the court system according to established rules of procedure. There are the Florida Rules of Civil Procedure as well as local rules for particular counties and courts. At these websites, you can find all of the documents filed in each personal injury lawsuit. They will include all written filings by the parties, as well as Orders issued by the Judge. Heavily-contested cases can have hundreds of documents filed with the clerk before the matter is concluded. During the course of a slip and fall lawsuit in Florida, a variety of requests (usually in the form of “Motions”) will be made to the Judge pertaining to things like hearings, discovery and the entry of a judgment. Motions must be made in writing and they must follow certain criteria, including things like notice requirements. Motions are presented to the clerk for inclusion in the case file and consideration by the Judge. 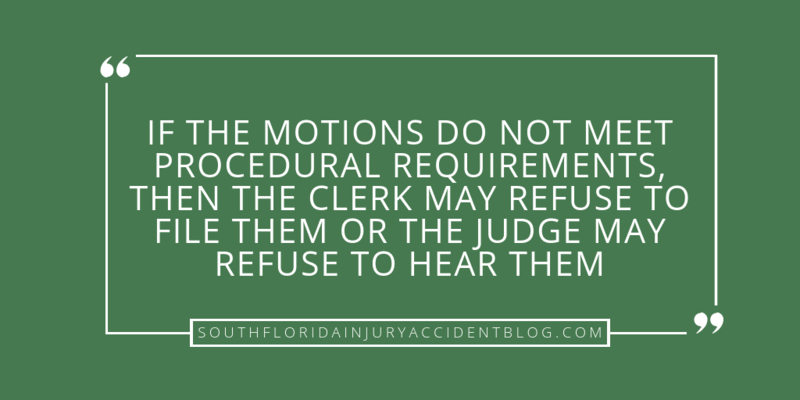 If the Motions do not meet procedural requirements, then the clerk may refuse to file them or the Judge may refuse to hear them. Motions are written requests by a party to a lawsuit asking a Judge to make a specified ruling or Order related to an issue. For example, a slip and fall victim as a “party plaintiff” can “move” to have the court issue an order requiring the defendant turn over any video surveillance of the slip and fall. The judge’s decision on a Motion is official once it is documented through a written order signed by the judge with copies provided to all parties. For the most part, Judges decide, at their discretion, when they will issue a ruling. In Florida, either side can schedule a conference with the Judge. All the parties must be notified of the request, of course. Under Florida Rule of Civil Procedure 1.200, you can ask for something called a “Case Management Conference”. Here, you can remind the Judge that a motion is still pending. But be prepared, once you request a status conference, things may snowball. (7) Scheduling more conferences or determine other matters that may aid in the disposition of the case. Another approach is to call and check on the motion with the Judge’s office (usually the Judge’s Judicial Assistant, or JA, will be the one answering the phone). The JA is the “front office” for the Judge’s office. This is an informal tactic and is entirely legal to do without notifying the other side that they are following up with the court. However, no attorney should speak to the Judge about a pending matter without all other counsel being present. That is not ethical and it is not allowed. This approach begins with the lawyer (or his or her assistant) calling and asking to speak with a Judicial Assistant. Judicial Assistants provide administrative support to the court. This includes answering questions about the court’s calendar and the status of pending motions. For instance, if you want to follow up on your Motion, a phone call with the JA may reveal that the Judge has been presiding over a time intensive trial and has spent most work days occupied over this proceeding. The JA will likely inform you that the Judge will get to pending motions as soon as he or she can. After some time has passed, or when there is urgency to your motion, you may need to take some extraordinary measures to get a ruling on your motion. This may mean going to the reviewing court (the state court of appeals) for help. Here, you can file something called an “extraordinary writ.” Writs are orders that allow actions to proceed and they are issued by the higher courts at both the state and federal levels. There are all sorts of writs, such as “writs of certiorari” issued by the U.S. Supreme Court, to “writs of habeas corpus” issued in criminal cases. For a pending motion, it is likely that the extraordinary writ you will seek is a “writ of mandamus.” You do this by filing a “Petition for Writ of Mandamus” to the Florida appeals court. If your petition is granted, then the higher court will issue its “writ of mandamus” to the Judge presiding over your lawsuit. It will compel the trial Judge to rule on the motion. The appellate court will not rule on the motion, but it has the power to demand that the lower court Judge do so. Before taking this step, consider the following: Obtaining a Writ of Mandamus is difficult to achieve. This is because your burden is high: you must establish that the Judge has failed to follow his or her duty to rule on your Motion. Also, the other party (parties) to your lawsuit will be required by the appeals court to file a response to your petition. They may disagree with your petition and may seek to undermine your petition by pointing out weaknesses in your position and argue them against you. Additionally, some trial Judges do not appreciate having their behavior reviewed, but particularly on something like a calendar delay. Judges in Florida are busy, and chances are they have a good reason for not yet ruling on your motion. Finally, filing an extraordinary writ must be weighed against the very human reaction a Judge may have for taking this step to force him or her to act. Another informal approach may be to write a letter to the Judge about the pending motion and the need for a ruling. The Rules of Procedure states that this is acceptable as long as all the parties are copied with the correspondence. In the letter, you can be short and sweet. Just remind the Judge that a motion is outstanding, and ask for an update. Address the letter to the attention of the Judicial Assistant. Finally, there are certain cases where the Judges do have some procedural requirements to meet in ruling on Motions made in pending litigation. For instance, family law cases are special kinds of matters. In family law, child custody issues may be vitally important and need fast action. The same is true for child support issues. So, in Florida family law cases, the Florida Supreme Court has enacted a special set of procedural rules. These include mandates where Judges have to rule, or at least set a hearing, on certain issues. See, Florida Family Law Rules of Procedure. Most motions deal with specific issues, such as extending discovery deadlines, excluding some type of evidence or witness, or compelling actions like depositions. However, there is a Motion that can end a case by entry of a judgment in favor of the moving party, called a Motion For Summary Judgment (MSJ). In a Motion For Summary Judgment, the party is asking the Judge to rule on the entire case and enter a final judgment in the proceeding. These motions replace the need for any trial because they are summary dispositions of the lawsuit. Accordingly, it will likely take a Judge longer to review, analyze and decide on a Motion for Summary Judgment. The Judge may be mandated to rule “immediately,” but that does not mean he or she will not need time to consider the arguments of counsel during the hearing, as well as the documents filed, like memorandum of law, regarding the MSJ. Strategically, it may not be wise for the movant to be anxious when awaiting the Judge’s decision on a summary disposition. If it’s a close call, then aggression may sway things to a non-appealable denial of the MSJ. A good piece of advice if you are having difficulty getting a motion heard by the court, is to speak with an experienced trial lawyer. Most trial lawyers, like Alan Sackrin, will offer a free initial consultation (over the phone or in person) to answer your questions. Thank you, For Sharing this information.